The month of October brings an electrifying feel to the Avenue for the Arts, as well as to the rest of downtown Grand Rapids, as artists from all over the country showcase artwork during Artprize, which coincides with First Fridays on the Avenue. 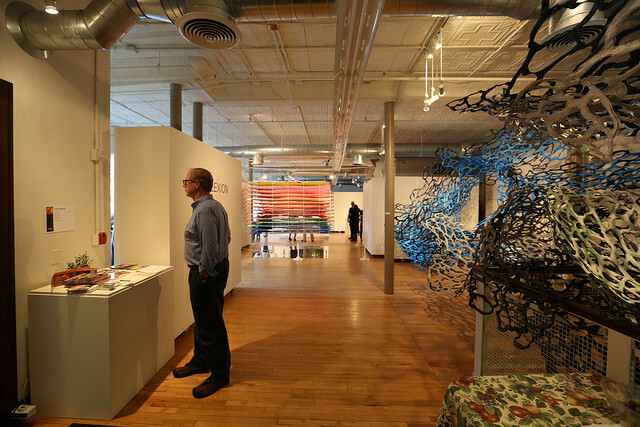 On the first Friday of every month, Grand Rapids residents and visitors are invited to the galleries, shops and eateries of the South Division corridor to check out new events and features. The month of October brings an electrifying feel to the Avenue for the Arts, as well as to the rest of downtown Grand Rapids, as artists from all over the country showcase artwork that probes viewers to ask questions, be challenged and admire beauty and complexity. As a part of the Avenue’s First Friday Event series this month we are featuring venues that are both First Friday participants and Artprize venues. The South Division corridor may seem somewhat off of the beaten path for ArtPrize visitors, but the exhibitions here shouldn't be missed. Over 100 artists chose to exhibit their work in the Avenue for the Arts this season. Among our favorite exhibitions is the Eros and Agape Project. Eros and Agape is a book, a gallery exhibition of 16 pieces,rotated four at a time, and a spoken word performance. Erwin Erkfitz's silkscreen illustrations accompany the prose of U.S. Army Combat veteran, Zachary Gruchow. After his time in the military Gruchow was determined to better understand what brought him to Afghanistan and Iraq and how the local population was affected by his presence. In their book, the Grand Rapids locals juxtapose a collection of illustrations and stories about love, duty and war with a retelling of The Iliad. Gruchow and Erkfitz chose to present their work at the Avenue for the Arts Workspace located at 307 Division Street. Just across the street at Cathedral Square, 40 artists are participating in an exhibition with the theme “HeARTbeat: The Pulse of Art and Life.” exploring the rhythms of community, nature and consciousness through their work. The 100 block of South Division is active with First Friday venues. Be sure to grab a doughnut from Propaganda Doughnuts and then head next door to Vertigo Music. Vertigo is hosting several ArtPrize artists, including: Jeonghun Koe, John Prince, Ian W. Daykin, Jonathan D. Lopez, c.l. chappell and Wesley School Room 11 of the Muskegon ISD center. 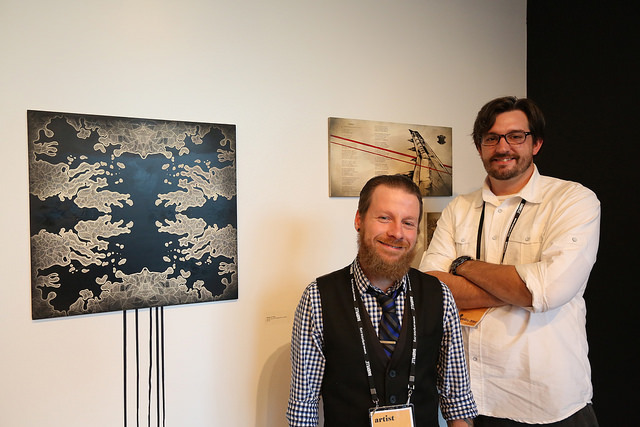 This year the Calvin College (106) Gallery presents REFLEXION, a collaboration of nine ArtPrize artists. This exhibition explores ways in which art and process relate to reflexion – a bending back. The artists approach this through various forms of traditional and non-traditional painting, printmaking, sculpture and installation that open new ways for the viewer to engage in art. Heartside Gallery artists respond to changes in the neighborhood with their easily accessible exterior window gallery on 48 S. Division Ave. The show, "Unchain the Neighborhood," represents the unheard experiences and stories by 15 Heartside artists tackling the theme as a direct response to the ever-expanding and changing neighborhood that Heartside has been a part of for over 30 years. The entry has garnered attention as a finalist in the Jurors' Shortlist in the 2-D category. Walk a little further and visit Craft House at 40 South Division. Featuring local artist Alaina Clarke. Clarke is a metalsmith but for this project she has chosen to work with paper (recycled love letters, to be exact), and cutting, folding and sculpting multi-faceted, racquetball-sized, gem-like objects. For Clarke, this project is an exercise of love, a meditation on words and paper on the deeply embedded meanings associated with a handwritten letter and on how those meanings are changed or lost in contemporary technology. 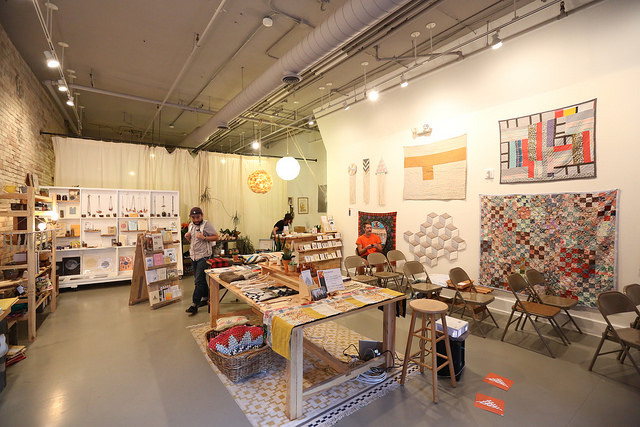 On the North end of the Avenue you can check out The UICA. Located at 2 West Fulton, this Avenue anchor already acts as a space for artist exploration and for Artprize 2014 brings together 20 collaborative artists. The exhibition explores themes of community, identity, learning, nature and more. It also features the Michael Murphy’s “Gun Country,” which has already sparked much conversation. First Fridays are always happening along the Avenue but be sure to not miss any of the stops during our ArtPrize. Most venues are open from noon until 8 p.m., with some opening even earlier. For an interactive map visit the ArtPrize website and look for venues along South Division Avenue between Fulton and Wealthy Street.